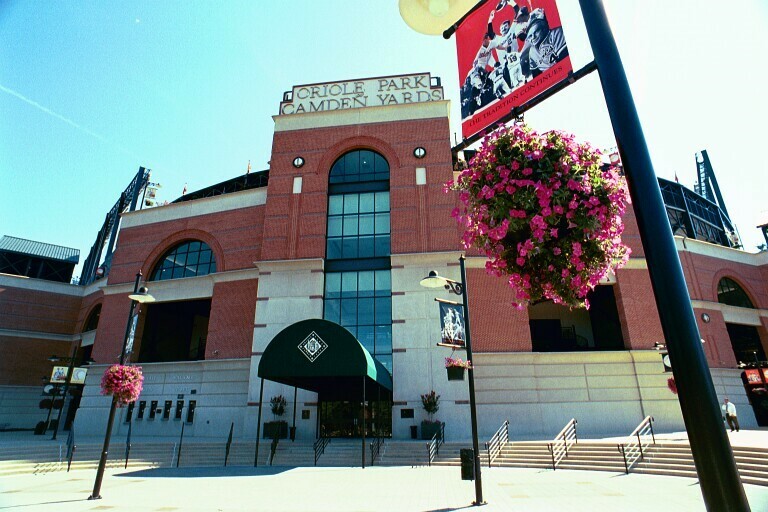 It was 15 years ago this week that I walked out of Oriole Park at Camden Yards to begin my life as a “former” Major League Baseball Head Groundskeeper at the ripe young age of 40. My 15 ½ year ride with the Orioles was over. But, it was of MY choosing. In the years since then, many have asked me why I would leave such a “prestigious” job. For me it was a no-brainer. I was fortunate enough to reach my career goals early in life. I was ready for a new challenge with a new goal. 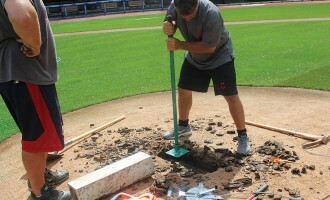 I began working as a groundskeeper for the Orioles when I was 24 and became the Head Groundskeeper by the time I was 30. I loved the job, loved the physical labor, had a great crew, and loved the people I worked with in the organization. But over time, things change. The long hours get to you, and family life can increase the demands on your time. In December of this year I will have spent the same amount of time here at Beacon as I did minding the ballfield for the Baltimore Orioles. Hard to believe it has been that long. What I find even more amazing is how old Oriole Park is now. It only seems like a couple years ago that we opened that ballpark in 1992. I have never looked back and wished I had my old job back with the Orioles. Too many things in that part of the industry have changed, and in some cases not for the good. 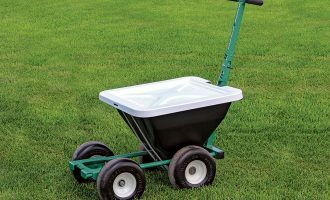 The demands on today’s stadium groundskeepers are huge with much busier field event schedules and less time to accomplish critical groundskeeping tasks. We probably aren’t too far away from ground crews working like road reconstruction crews, in the middle of the night under the lights. There is no rest for the weary. I admire all of you who continue to plow through it and do whatever it takes. It’s a hard life, and even harder if there is family involved as this profession will constantly pull you away from them. It takes a strong spouse to support you and your crazy schedule. You put in long hours on an almost daily basis with each other. You bond and overcome the hurdles together. When it’s time to “go to war”, they will be at your side. Those bonds with your crew members are what you will take with you for the rest of your life when you leave that job. In the future, like old army buddies, you will relive the events you endured through together with a sense of accomplishment, pride and probably lots of humor. And that is what makes the experience so worth it. I celebrated my anniversary this week with two of my former employees, Rodney Lane, one of my former assistants at Oriole Park and also with Rob Doetsch, whom I hired on as a young teenager in 1992. Just 2 years or so later I gave Rob the control of the Tarp Crew at Oriole Park and he has been at the helm ever since and continues to serve the same position under current Orioles Head Groundskeeper, Nicole McFadyen. 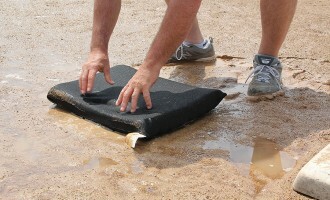 Rob is a longtime valuable asset to the Orioles ground crew. 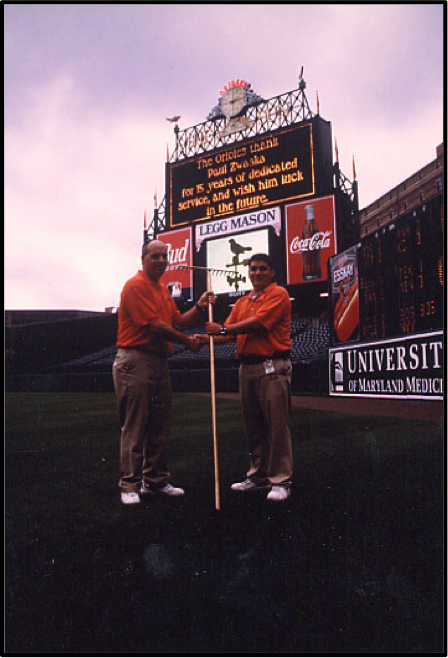 If you’d like to listen in on some of our recollections during my time as the Orioles Head Groundskeeper, checkout Beacon’s new podcast Diamond DaVincis. You can also find it on the Beacon homepage at beaconathletics.com. You can listen to it on our website or download from iTunes. Look for the episode titled “Live Lawn And Prosper” which should be posted later this week.